What are these discs on the Crawler-Transporter? I've just watched this footage of SLS's Mobile Launcher Platform being rolled out to LC-39B for fitting tests. On the front of the drive trucks are two rotating discs with red markings which are clearly visible around 00:06 in the video that I haven't noticed before. I presume they are some component of the drive mechanism, but I can't work out what. What are they and what is their function? They are very reminiscent of disc brakes; the blue objects look a lot like brake calipers. However, if this is the case, I'm unsure why they're totally exposed rather than within the structure. For cooling? The Discs attached to the shaft ends of the DC Propel motors are brake discs. There are two different brakes on each disc. One set is parking and the other is service. Parking brakes are run by hydraulic DOT5 brake fluid. The service brakes are air brakes similar to other air brake applications on heavy duty tracks and busses. The air brakes are controlled by a pedal in the cab. The hydraulic parking brakes are controlled by a switch and it runs a electric over air system. The air is used to depress a diaphram in a cylinder that is attached to a master cylinder, similar to what is in your car. The assembly is called a "Power Cluster" and is simply air over hydraulic. The parking brakes are smaller than the service brakes and the pads get very little wear since they apply when the crawler is stopped. The service brakes don't get used very much either, the crawler normally coasts to a stop unless there is an emergency. 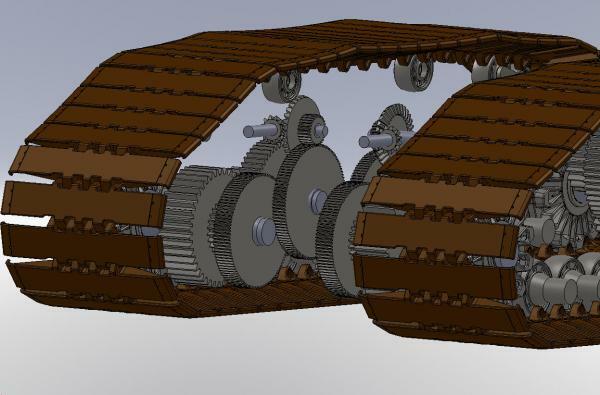 Here's a CAD image of the drive train. The two shafts at the top coming forward go into the drive motors. The brakes are on the forward end of the motors. Not the answer you're looking for? Browse other questions tagged identify-this-object sls crawler-transporter or ask your own question. What are these 'Lego' plates inside the Atlas 5 fairing? What are these thirteen purple grape-like things inside this tank? What are these two very large, round panels on opposite sides of AngoSat-1? Which one of these (if any) is the Moon? What are the rest?